In Ireland, the Great Famine was a period of mass starvation, disease and emigration between 1845 and 1852. It is usually known outside Ireland as the Irish Potato Famine. This was only one of many famines in the country and across Europe over the centuries but this one had a particularly devastating effect on the country. The worst years were from 1845 to 1849. During the Famine years, Ireland’s population fell by between 20 and 25 percent. It is estimated that approximately 1 million people died and a million more emigrated from Ireland, many to the United States and Canada. The Famine did not affect all areas of the country to the same extent. The cities – Dublin, Belfast and Cork, for example – continued to grow while rural areas, more particularly in Connaught and Munster, were badly affected by the local population’s dependence on the potato crop and their distance from sources of other food. This map shows the uneven effects of the Great Famine on the population numbers across the country. 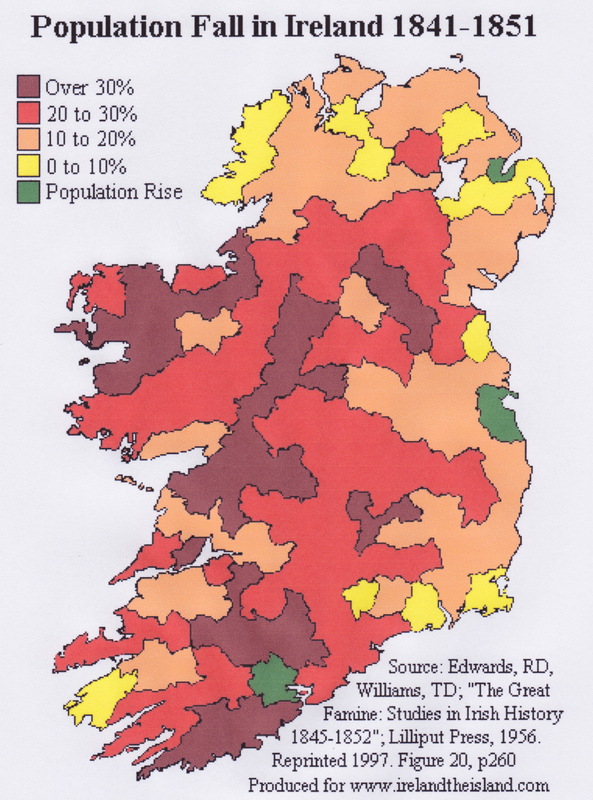 Most of County Tipperary was badly affected (shown as red), losing 20-30% of its population. However some other areas of Connaught and Munster lost over 30% of their people. The immediate cause of the Famine was the potato blight. Although blight ravaged potato crops throughout Europe during the 1840s, the impact and human cost in Ireland—where about a third of the population was entirely dependent on the potato for food—was made worse by many political, social and economic factors, including the effects of British rule and absentee landlords. The Famine was a watershed in the history of Ireland. Its effects permanently changed the island’s demographic, economic, political and cultural landscape. The Great Famine caused many farms in Ireland to be abandoned in the late 1840s, landlords went bankrupt and tenants who survived the Great Famine fled the land if they could. By the early 1850s, Irish landlords were looking for tenant farmers and there were economic opportunities to be had. Our branch of the Smiths decided to take advantage of these opportunities. Want to know more about the Great Famine? This is a good website to use for a quick overview. This entry was posted in Smith, Tipperary and tagged Great Famine, Smith, Tipperary. Bookmark the permalink.